OTTAWA — The Ottawa Senators have said they’ve been playing better during the past 10 days but weren’t being rewarded. They got their reward Saturday when Mark Stone scored with 37.5 seconds left in overtime to give the Senators a 2-1 win against the Boston Bruins at Canadian Tire Centre. 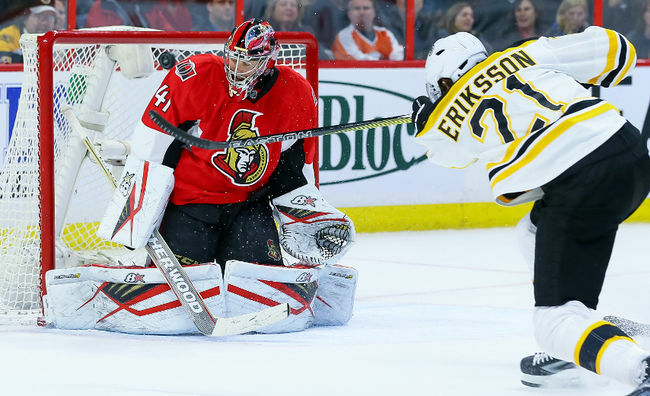 Stone lifted the rebound of his wraparound attempt over Bruins goaltender Tuukka Rask and just under the crossbar a few seconds after Boston’s Loui Eriksson had hit the post. Mika Zibanejad scored in regulation and Craig Anderson made 33 saves, including one on Eriksson’s breakaway earlier in overtime, for Ottawa (20-16-6). The Senators will try to win consecutive games for the first time since Dec. 3-5 when they visit the Washington Capitals on Sunday. They hold the second wild card into the Stanley Cup Playoffs from the Eastern Conference with 46 points, one more than the Pittsburgh Penguins and the New Jersey Devils. Rask made 38 saves and David Pastrnak scored for the Bruins (21-14-5), who are 1-0-1 on a five-game road trip that continues against the New York Rangers on Monday. The Bruins are a point ahead of the Senators. Stone’s giveaway had led to Pasternak’s goal, so getting the winner was redemption for him. “You never liked to get scored on,” said Stone, who scored his 11th goal. “I don’t think anybody wants to be out there when the other team scores a goal, so obviously you get frustrated. It’s a tough time in the game, first shift of the second period. The Senators are 2-3-0 in their past five games but have seen some encouraging signs. “The biggest thing is we’ve been sticking to it,” Zibanejad said. “We’ve been talking about that a lot, keep doing what we do. It’s nice to see that we don’t get away from it. Anderson said he liked the way the Senators kept their composure in a tight game. Eriksson had two great chances to win it in overtime, the first off a 2-on-1 and the second when he broke in and hit the post just before Stone scored. The Bruins tied the game 41 seconds into the second period after a couple of mistakes by the Senators in their own end. Anderson failed to stop a puck behind the net on a shoot-in, and Stone gave the puck away to Bruins center Patrice Bergeron along the left-wing boards. Bergeron gave it to defenseman Zdeno Chara, whose shot from the left point was deflected by Pasternak and went past Anderson. The Senators scored the only goal of the first period on a splendid example of why Erik Karlsson is one of the NHL’s most dangerous offensive defensemen. Karlsson blocked a shot by Bruins defenseman Colin Miller in front of the Ottawa net and immediately took off as the puck bounced to the right wing. As forward Milan Michalek took possession, Karlsson had put three Bruins behind him by the time he reached the Ottawa blue line. Michalek made a fine pass to Karlsson in the neutral zone to create a 2-on-1 for Karlsson and Zibanejad. Karlsson went to the left and fed Zibanejad, who made a nice forehand-to-backhand deke before beating Rask at 13:28 for his eighth of the season. Rask grudgingly agreed that earning three points in the first two games of the trip was a bright spot. The Bruins got a good performance from center Ryan Spooner, who was moved up to the second line in the absence of injured center David Krejci. Spooner shared the team lead with six shots on goal and was 8-2 on faceoffs, including 5-0 in the defensive zone. Boston forward Brad Marchand returned to the lineup after serving a three-game suspension for a hit on Ottawa’s Mark Borowiecki in the Bruins’ 7-3 win on Dec. 29. “We didn’t have a great start, but once we got our legs under us and started playing our game, I thought we played pretty decent,” Marchand said.